If you're interested in attempting to repair your major appliance yourself to try to save a little money, a good place to start is purchasing a product repair manual. Do it yourself repair manuals are often produced by the appliance manufacturer and provide a step by step guide to many of the common repairs periodically required. With them you can read up on possible causes and tool requirements before hand to decide if the repair is a job you want to attempt on your own or whether a trained appliance service technician is in order. Service manuals on the other hand describe in detail how an appliance is designed to function. When used along with the 'tech sheet' provided with the machine, a trained technician can identify the cause of problems with its operation. These General Electric manuals contain problem diagnostics to help you identify the cause of the problem and then refer you to specific repair procedures. Skill level ratings for each job indicate how easy or complex the repair should be so you can decide in advance whether to proceed on your own or not. Their step-by-step instructions written in language easily understood, plus photo illustrations, help to guide you through each step of the repair process. *In Canada, Whirlpool, KitchenAid, Admiral and Roper are registered Trade-marks of Whirlpool Canada Inc. 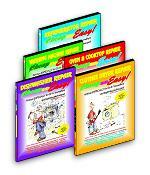 There are also third-party appliance repair manuals that can be just as useful. One such is the "Cheap and Easy!" series. Each "Cheap and Easy" manual contains illustrations with simplified instructions for diagnosing and repairing many of the common problems on a variety of appliances. Some of the titles available deal with specific brands while others deal with all brands or a particular appliance in one single volume.